Commercial rice cookers for restaurant and sushi bars. 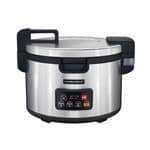 Commercial rice cooker is perfect for restaurants with high customers turn over. Since rice became very popular in mealtime because of menu items like sushi and other types of side dishes served in multicultural restaurants. CKitchen's electric rice cookers meets the increased demand for quality cooked rice in various food manipulations. Our rice cookers are easy to clean, use, store and has a capacity to cover demands of any food service provider. 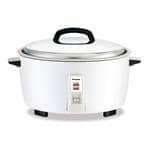 Commercial Rice Cookers will satisfy needs of the most demanding restaurants. CKitchen.com offers a line of rice cookers from leading commercial kitchen appliances manufacturers Panasonic and Adcraft. 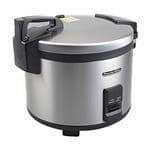 Adcraft rice cooker is electric with a 30 cup capacity constructed with a stainless steel lid with a watt range of 1650-1800. Panasonic rice cooker is electric with a “keep warm” feature, s start button and automatic shut off technology. Panasonic’s unit is also constructed in stainless steel and has a 6 oz cup capacity. Purchase a rice cooker from CKitchen.com today for a guaranteed unbeatable price and top product performance and reliability. If you need help choosing the right rice cooker or any other kitchen appliances or any other food service equipment, feel free to contact us and our certified food service equipment professionals will assist you.